Russ Chapman of Carlson Energy demonstrates an alternative, simple method for brake pad replacement and wear adjustment on a model 7503 Caliper Brake – in the offices of Clutchco of Lousiana in Lafayette, Louisiana. Carlson Energy brakes are some of the EASIEST to adjust and maintain in the field. A much simpler design, with less moving parts, makes the job of replacing the brake shoes and pads – or adjusting the brake for wear – a simple operation, when compared to competitive designs. Russ Chapman of Carlson Energy demonstrates the simple method for brake pad replacement and wear adjustment on a model 7503 Caliper Brake – in the offices of Clutchco of Lousiana in Lafayette, Louisiana. And this helpful mechanic’s tip makes the job even easier. Russ Chapman, Sales Manager for Carlson Energy, demonstrates a #7503 Caliper Brake on the drum of a Wireline Truck from Synergy – during LAGCOE 2013 in Lafayette, Louisiana. 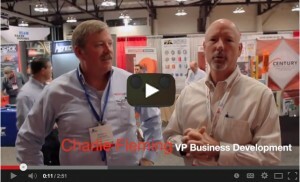 Russ Chapman, Regional Sales Manager for Carlson Energy, recently spoke with Charlie Fleming, VP of Business Development for Clutchco International, at LAGCOE 2013. Carlson Energy products are tougher built, easier to use and easier to own – yielding significant initial and ongoing cost savings. 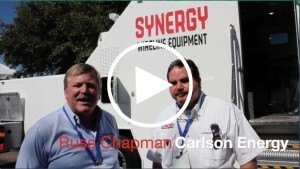 Russ Chapman, Regional Sales Manager for Carlson Energy, recently interviewed Paul Morrison, President of Synergy Wireline Equipment – at LAGCOE 2013. In advance of the upcoming LAGCOE in Lafayette, Louisiana, Carlson Energy announces three new Master Distributor Agreements. Furthering their commitment to customer service, each Master Distributor will hold a stocking inventory, enabling them to offer the quick problem solving and turnaround their customers – and the industry – demand. While the technology is unique in the industry, of particular note is the fact that Carlson Energy’s products are made in the USA – Wichita, Kansas to be exact. The Heavy Duty Brakes, Rotors and Clutches – designed specifically for use on well servicing rigs and wireline trucks; for onshore and offshore applications – compete directly with Canadian and Chinese-made products and are rapidly gaining acceptance in the marketplace. Headquartered in Wichita, Kansas with offices in Dallas, Texas – Carlson Energy, a division of The Carlson Company, is an industry leader in the design and manufacture of Brakes, Rotors and Clutch products that meet the need for rugged, robust equipment that can withstand the harsh environments found in the oil & gas fields, on and offshore. Since 1961, The Carlson Company has been designing and manufacturing the POWER FLO line of air clutches, air brakes, clutch/brake combinations, hydraulic clutches, hydraulic brakes, caliper brakes and torque limiters. With an in-house design engineering and technical support staff – Carlson Energy has become the industry leader in designing and manufacturing Brakes, Rotors and Clutch products – field-proven for decades in the toughest Oilfield conditions. Visit www.CarlsonEnergy.com to learn more about the full range of Carlson Energy products. Clutchco International Inc. is a Factory Authorized Oilfield Distributor and Rebuild Center for Oilfield Clutches and Oilfield Brakes with headquarters in Houston, Texas and stores located in Longview, Odessa and Fort Worth, Texas and Lafayette, Louisiana. Clutchco serves the Drilling and Well Servicing markets, both onshore and offshore, with more than 60 years combined experience working in Oilfield Clutches and Oilfield Brakes. Clutchco International’s customers benefit from placing their trust in a staff that truly understands their needs, as each team member specializes in their own field of Clutch and Brake applications used on Oilfield equipment, both domestic and international. Visit www.clutchcointl.com to see the full range of Clutchco products and services. Hess Services, Inc. of Hays, Kansas, began operation in 1989 and since then has rapidly grown into a diversified oilfield and industrial business. Hess Services designs, fabricates, repairs, sandblasts and paints oilfield and industrial equipment, including storage tanks, truck mounted service rigs, well servicing rigs, and drilling rigs. The company’s eight business segments include: sandblasting, painting, trucking, crane and rigging service, welding and fabricating, parts sales, fiberglass tank manufacturing, and machining. Today Hess Services, Inc. has over 300 employees in two manufacturing plants with over 280,000 square feet situated on 182 acres. Visit www.hess-services.com to learn more about the full range of products and services. PEMCO of New Mexico, Inc. started in Hobbs, New Mexico in 1965 as an oilfield repair and manufacturing firm. PEMCO refurbishes and remanufactures oil well servicing equipment, most recently diversifying their business by developing working relationships with the wind generation and electric power plant industries. Known as resourceful and ingenious, PEMCO also reverse engineers obsolete rig parts, expanding their inventory to include these items. For more information about PEMCO of New Mexico, Inc., visit their website at www.pemconm.com. © 2018 The Carlson Company, Inc. All rights reserved.